This morning as I walked into the kitchen, the fruit bowl caught my eye. It was a rare sight on a few points because, first, the bowl is normally half-empty to empty. With all of the people in our home, the fruit generally disappears pretty quickly, for sure! So, to see it full must have been a shock to my system. (It was only full because I came back from grocery shopping around 9:30 last night and people hadn’t yet had a chance to take a piece…) But the other thing that caught my eye was how the morning sunlight just filled the bowl and reflected off of the fruit. Usually in the morning, the curtains are closed, but this morning, the open curtains allowed light to flood the kitchen. 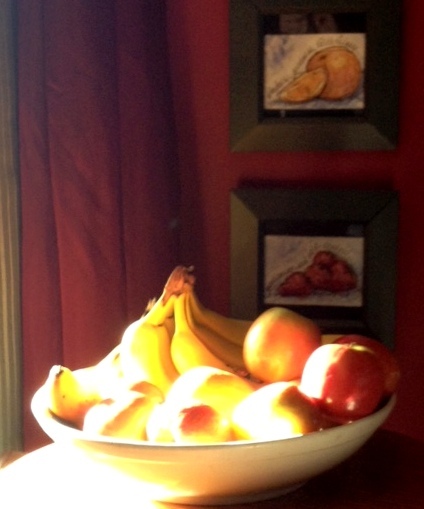 Above the fruit bowl are little plaques with sweet little paintings of fruit that my sister had done. There are watercolor paintings of fruit and on each one, there was part of the verse from Galatians that talks about the fruits of the Spirit. Fruit is a good thing. It’s the end result of sowing seeds…the goal is to bear good fruit which nourishes and produces a harvest of even more seeds. Fruit is kind of like that finished product for a plant that says, “YES!! The Hard work paid off…all of the perseverance produced something, bore something good, something sweet, something which will have an impact on in the days and years to come. But if fruit isn’t shared, eaten, used in a timely manner, it will quickly spoil. It will be wasted. I guess where I’m going with this, is that in a very hungry world that’s spiritually famished, we need to share fruit. Christians need to bare it and share it. Fruit that sits in the dark unlit corners and goes unshared just spoils. But just like the sun lit up the fruit in my kitchen, the Holy Spirit can just enliven the gifts in us to be used in the lives of those around us. Is it easy to constantly be patient, good, kind, gentle, loving, joyful, and self-controlled? Nope, not one little teeny tiny bit easy. But it’s a result of a connection to the tree, the vine, so to speak. I’ve been asking myself a lot of questions lately. I don’t want to be like the plastic fruit that looks loving and kind only to turn to be ingenuine and insincere in my words and actions. Plastic fruit doesn’t taste good. It looks good until you pick it up and realize that it’s a fake. Fake doesn’t bear seeds and nourish. Fake sits and looks pretty, period. I want to be so connected to my Savior, that what naturally comes out of me is fruit born by that relationship with Him, Holy Spirit planted, enlightened, grown. But that doesn’t come by sitting and looking pretty. That comes from determination to grow in my relationship with God and shoe-leather that actually does the stuff that will grow it. Planting seeds isn’t easy for a farmer. It takes early mornings and long days. It takes physically hard labor, and mentally challenging strategies. It takes work, day in and day out, day after day after day, month after month. It takes faith, for there are many things a farmer can’t plan for. It takes waiting, for you can’t make a fruit ripen before it’s ready. There’s a process. There’s a timeline that can’t be rushed. Funny, the thoughts that can come in my kitchen on a cold December morning. All from light shining on a basket of fruit.